UYUNI, is one of the most important salt reserves worldwide. Uyuni and other salt flats nearby originated around 10,000 years ago. They are the last geological stage of a huge lake that once covered 7,800 sq. miles. This salt lake is also part of an ancient drainage system of the Titicaca and Poopó lakes in southwest Bolivia. The surreal scenery and unforgettable wildlife make this salt lake one of the natural wonders of Bolivia, without doubt the most photographed attraction in Bolivia. It has a long history of human occupation from pre-Columbian cultures, the Incas, and the Spanish. The local people still breed alpacas, llamas and fine vicuñas. Reception at Santiago de Chile Airport and transfer to your Hotel. Breakfast. Transfer from the Hotel to the airport and flight to Calama. 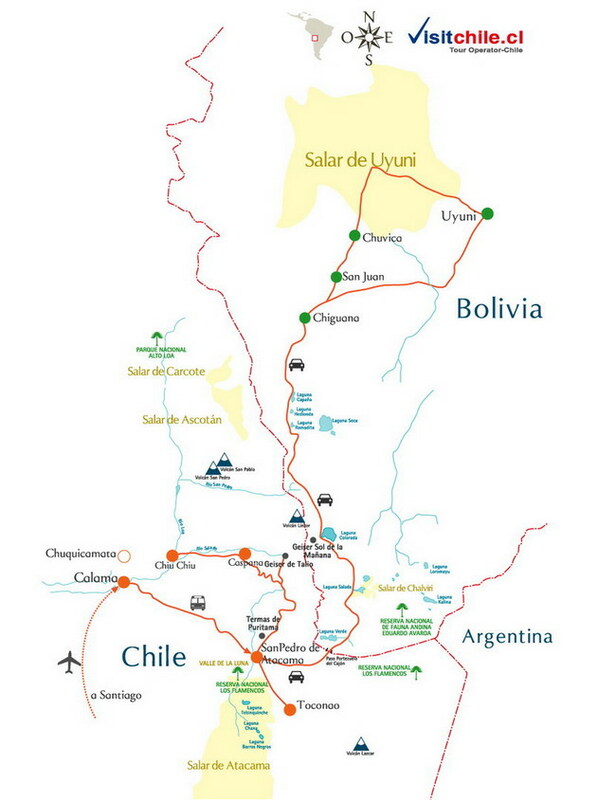 Reception at Calama Airport and transfer to the picturesque village os San pedro de Atacama. Afternoon hike a long the Cordillera de la sal up to the Moon Valley, an extraordinary mineral site at the sunset. Breakfast. Excursión into the Atacama SALT Flat whwere we observe pink flamingos. Then, visit of Toconao and fertile Jeria Canyon and drive to Miscanti Lagoon to enjoy spectacular views over the high plateau. Box lunch. Drive back to San Pedro de Atacama. • We visit White Lagoon and Green Lagoon. •• We go to “Polques” Thermal baths (hot springs) and Geysers. by keeping a wise distance. It is also said that this place is the house of goblins and devils for the abundant scent to sulfur of place. • We visit Red Lagoon (REA) with flamingos and Andean fauna of great importance. In this place we spend the night at the Mallku Hotel with dinner included. • We leave Red Lagoon at 09:00 a.m. to visit the Stone Tree. • We visit Altiplanic Lagoons: Cañapa, Hedionda and Ramaditas. • We travel until Chuvica (arriving approximately at 17:00 pm), where we spend the night in a hostal located in front of Salt Flat. Uyuni Salt Flat: With more than 12.000 km2 this considered as the biggest sea in salt of the world. With the mountain ranges and the sky like their only frontiers, he/she allows to observe images suspended by the solar radiation, the illusions and optic illusions caused by the crystallization in the floor and other surprising phenomena. In theirinterior uninhabited virgin islands they harbor cactus immense and strange floraciones. An entire succession of natural landscapes and capricious forms that from the first moment, they capture and they charm the visitor. Overnight at the Salt Palce Hotel. • We depart to the bigger Uyuni Salt. • We visit Salt Falt and the Incahuasi Island well known as Fish Island, appreciating the enormous cactus, a splendid view. • We see eyes of salt, and the handicrafts store. • Finally we go to Uyuni, arriving approximately at 2:30 p.m.
Overnight at the Hotel Jardines de Uyuni. Bring sun glasses, sun block, warm cloths.